The 84th Legislative Session, Senate Bill 11, Campus Carry law concerning concealed carry became effective on August 1, 2017 for South Texas College. The 84th Legislative Session, House Bill 910, Open Carry law took effect in the state of Texas on January 1, 2016, but does not apply to university or college campuses, therefore the open carry of handguns is not allowed on college property. Senate Bill 11 added section 411.2031(b) to the Texas Government Code and amended Texas Penal Code section 46.03, authorizing a license holder to carry a concealed handgun on or about the license holder’s person while the license holder is on the campus of an institution of higher education. These changes are effective at the college on August 1, 2017. Texas Government Code section 411.2031(d-1) states that the president shall establish reasonable rules and regulations regarding the carrying of concealed handguns by license holders on the campus … or on premises located on the campus. Before establishing these rules and regulations, the president must consult with students, staff, and faculty concerning the nature of the student population, specific safety considerations, and the uniqueness of the campus environment. The president cannot enact rules and regulations that generally prohibit or have the effect of generally prohibiting license holders from carrying concealed handguns on the campus. Texas Government Code section 411.2031(d-2) requires the Board of Trustees to review any rules or regulations that the college president adopts and may, by a two-thirds vote, amend those rules or regulations. Section (d-3) specifies the need to widely distribute the rules to students, faculty, and staff, while section (d-4) requires the college to submit to the legislature and relevant committees by September 1st of each even numbered year, a report that describes the rules and regulations that were adopted and explains the reasons why. The college must give effective notice under Penal Code Section 30.06, identifying any portion of a premise on which license holders may not carry. The notice may be given by oral or written communication. Written communication may be given individually on a card or document or through posted signage. General email messages were sent to all employees, outlining the process and dates of the forums. The Public Relations & Marketing Department used social media to communicate this information to college students. 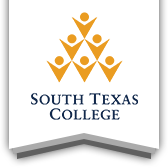 The Task Force consulted extensively with the South Texas College community, holding 20 forums with students, faculty, and staff at the college’s five campuses. A number of the forums were live streamed. These forums presented the requirements of the campus carry law, legal opinions of the Texas Attorney General, the timeline and process for implementation, identification of the restricted gun free zone website survey, and webpage for additional information on the law. The online survey generated 142 recommendations that were reviewed and considered by task force members. Discussions with the Faculty Senate, President’s Administrative Staff, Coordinated Operations Counsel, and Planning and Development Counsel were held to further review the implementation process and identify restricted gun free zones. Attendance at the 20 campus forums that were conducted is displayed below. The total compares favorably with the Campus Carry forum attendance at other colleges and universities. The determination of gun free zones was a result of input received during 20 campus forums, college survey website submissions, research of the law and Texas Attorney General Opinions, and deliberation with the Faculty Senate, President’s Administrative Staff, Coordinated Operations Counsel, and Planning and Development Counsel. College legal counsel and attorneys with the Texas Association of School Boards (TASB) were also consulted. a. Polling Locations - State law prohibits license holders of handguns from carrying a handgun on premises of a polling place on the day of an election or while early voting is in process. A sign shall be posted at polling place located on campus that reads either “Polling Place” or “Vote Here”. As determined by the college when elections are being conducted. a. Board Room - State law excludes license holders of handguns from carrying a handgun in room or rooms where a meeting of a governmental entity is held, if the meeting is an open meeting subject to Chapter 551, Government Code, and the entity provided notice as required by that chapter. On the South side of the second floor of Pecan Campus building X.
b. Mid-Valley Child Development Center - The concealed carry of handguns is prohibited on the premises of day care facilities to ensure safety to minors. On the North East side of the Mid Valley Campus just south of buildings D and L.
c. Testing Center Pecan Plaza - The concealed carry of handguns is prohibited on the premises of the testing center where by state or federal law or contract, at the sole discretion of the state or federal government or organization with whom the contract is entered, requires exclusion of a handgun in a specific location. At 2603 W. Pecan Blvd., McAllen, Texas in building C of Pecan Plaza. d. Other areas where contractual obligations prohibit concealed carry of handguns. e. Other areas prohibited by state or federal law. (1) on the physical premises of a school or educational institution, any grounds or building on which an activity sponsored by a school or educational institution is being conducted, or a passenger transportation vehicle of a school or educational institution. What is the Campus Carry law? Effective August 1, 2017, the 84th Texas Legislative Session, Senate Bill 11, Campus Carry law allows persons with a state issued Concealed Handgun License (CHL) or License to Carry (LTC) to possess a concealed handgun at community colleges, unless the area has been designated as a restricted, gun free zone by state law or the college. What is the Open Carry law? The 84th Texas Legislative Session, House Bill 910, Open Carry law took effect on January 1, 2016, allowing license holders to carry an unconcealed handgun in a waist or shoulder holster, but the law does not apply to college campuses, therefore the open carry of handguns is not allowed on college property. Will South Texas College faculty and staff be allowed to carry concealed weapons? The 84th Texas Legislative Session, Senate Bill 11, Campus Carry law permits license holders, including South Texas College faculty and staff, to carry concealed handguns on campus, unless the area has been designated as a restricted, gun free zone by state law or the college president. What process has South Texas College used to develop restricted, gun free zones? South Texas College conducted 20 focus group sessions at the campuses. A number of the forums were live streamed. These forums presented the requirements of the campus carry law, legal opinions of the Texas Attorney General, the timeline and process for implementation, and identification of the restricted gun free zone website survey and webpage for additional information on the law. Discussions with the Faculty Senate, President’s Administrative Staff, Coordinated Operations Counsel, and Planning and Development Counsel were held to further review the implementation process and identify restricted gun free zones. College legal counsel and attorneys with the Texas Association of School Boards (TASB) were also consulted. How will South Texas College notify individuals of restricted, gun free zones? 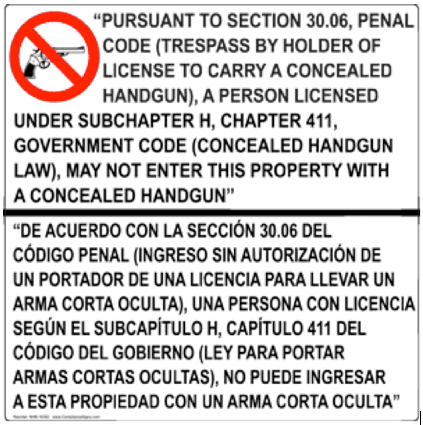 Contains wording that states, "Pursuant to Section 30.06, Penal Code (trespass by holder of license to carry a concealed handgun), a person licensed under Subchapter H, Chapter 411, Government Code (concealed handgun law), may not enter this property with a concealed handgun." Is displayed in a conspicuous manner clearly visible to the public. How can I obtain a Texas handgun license? “Concealed” means that the handgun is not visible. The handgun can be in a backpack, purse, holster underneath clothing, or in any other area in the immediate control of the license holder that is not in plain view of the public. If I can see the outline of a gun through someone’s clothes, backpack, or purse, is that considered concealed? As long as no part of the gun is showing (just the imprint), Texas law considers it concealed. What if I see a gun that is not fully concealed or I suspect a person is carrying a gun illegally? Contact the South Texas College Department of Public Safety (956-872-4444). Will I be able to find out which students have a concealed gun in my class? Information about persons who are licensed to carry a concealed handgun is considered confidential. Consequently, South Texas College will not have a list of licensees. Individuals holding a license are not required to disclose their status. The only exception is if police ask about concealed carry status for law enforcement purposes. If questioned, license holders are required to inform the police that a handgun is being carried. If asked by someone other than a police officer, the license holder cannot be retaliated against for failure to answer the question. Can a faculty or staff member post signage that prohibits handguns in their offices, classrooms, or other workspaces? Other than the requirements of Texas state law, only the South Texas College President, with the approval of the Board of Trustees, can designate areas to be restricted, gun-free zones. Only the South Texas College Department of Public Safety is authorized post signage. For more information concerning the Campus Carry law contact the South Texas College Department of Public Safety (956-872-4444). During the Texas 84th Legislative session, Senate Bill 11, known as the Campus Carry law was passed, permitting license holders to carry a concealed handgun on the campus of a university or college, effective August 1, 2017 for community colleges. Campus is defined as all land and buildings owned or leased by the college. The Campus Carry law allows colleges and universities to establish reasonable rules and restricted gun free zones, based upon recommendations of students, faculty, and staff with consideration of the nature of the student body and the campus environment. The rules and restrictions may not generally prohibit or have the effect of generally prohibiting handgun license holders from carrying concealed handguns on campus. Within 90 days after the rules and restrictions are adopted, the College Board of Trustees will review the provisions and, if approved by at least two-thirds of the Board members, amend the provisions in whole or in part. The college is not permitted to prohibit handgun license holders from carrying concealed handguns beyond the rules and restrictions that are implemented. The college is required to report to the Legislature by September 1 of each even numbered year, a description of the college’s rules and restrictions regarding the carrying of concealed handguns on campus by license holders and explain the reasons for those rules and restrictions.